Well, we're still tabulating feedback from SolSun hosts around the country, but we can report that over 1000 people gathered together in something like 80+ homes/cafes/etc to write over 5000 letters/postcards/etc and to have who knows how many amazing and necessary conversations! WOW. Good job everyone! And THANK YOU. Let's keep it going! 1. Today we begin by turning our attention back to Tr*mp's Cabinet of Horrors and his EPA pick, climate-change-denier and fossil-fuel-industry-BFF Scott Pruitt. Nearly 500 current and former EPA employees agree: Pruitt is THE WORST. He is likely to be confirmed this week—to be clear, his confirmation is near-certain, but we STILL need to make it clear that we OPPOSE this terrible decision. "My name is ______ and I'm from ______. I stand with the overwhelming majority of Americans who agree that we need strong action on climate change now. I urge you to oppose Scott Pruitt and demand an EPA Administrator who is guided by science, who respects our environmental laws, and who will place protecting public health first." Then, tell your friends and family who live in states w/ Republican Senators to call THEIR Reps about Pruitt! 3. We're seeing reports of ICE raids all over the country—while these are nothing new, and aren't necessarily originating with Tr*mp (in fact, they should serve as a reminder of one of the darkest, most problematic aspects of Obama's presidency), it does seem that ICE and immigration officers are emboldened by Tr*mp's new policies. 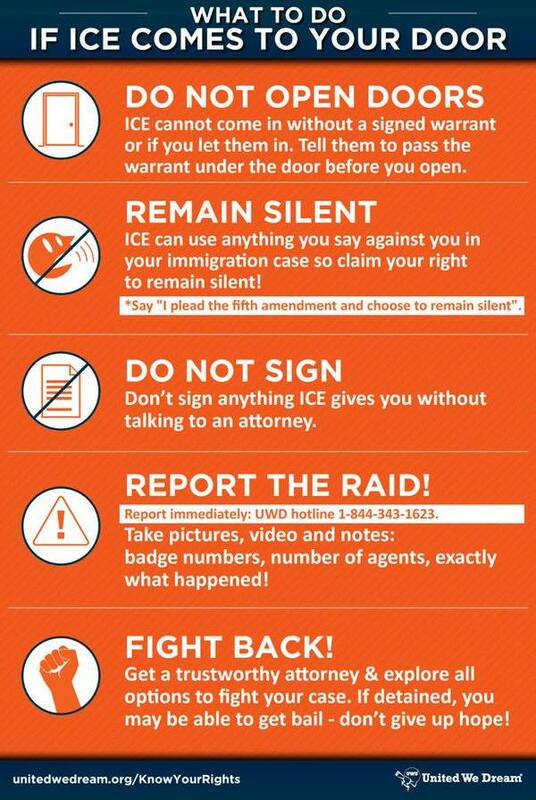 Please help spread important information about legal rights in your community by purchasing Know Your Rights cards from the ACLU and distributing them as you see fit.